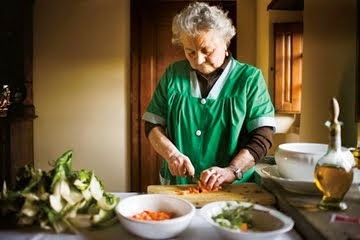 Over time I came to realize that Nonna showed her love through cooking. My Dad picked up some recipes from her and I from him. 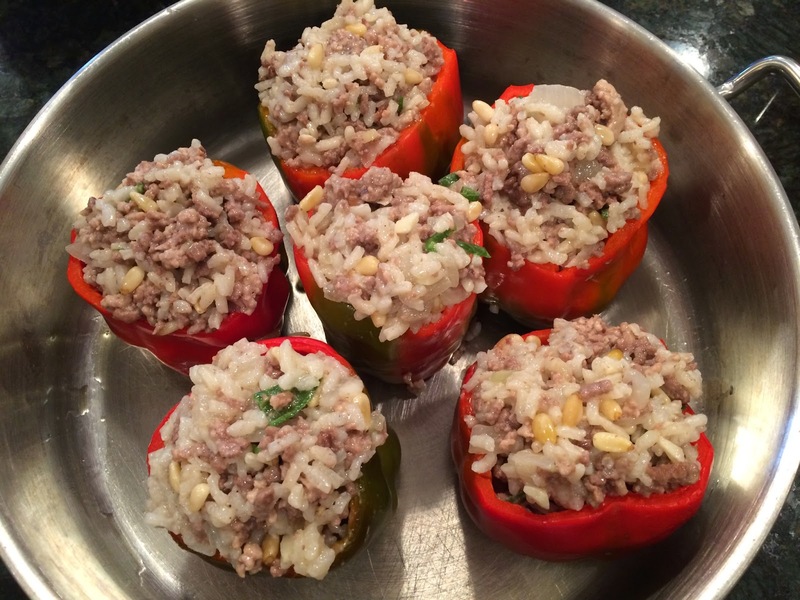 So when I recently wandered into the smallest Osteria in Radda and saw someones Nonna working feverishly behind the counter on some of the most beautiful stuffed peppers I’d seen, I knew I wanted to try out this recipe when I got back. Just a few notes…. I used Bell Peppers from my own garden, hence the variation in colors. I made “risotto” in advance with the arborio rice. If you don’t want to bother with that, you can use plain white rice. I also used a long, thin hot pepper from my garden, but you can easily subsitute the crushed red pepper or omit entirely. Trim the top of the peppers and clean the inside. 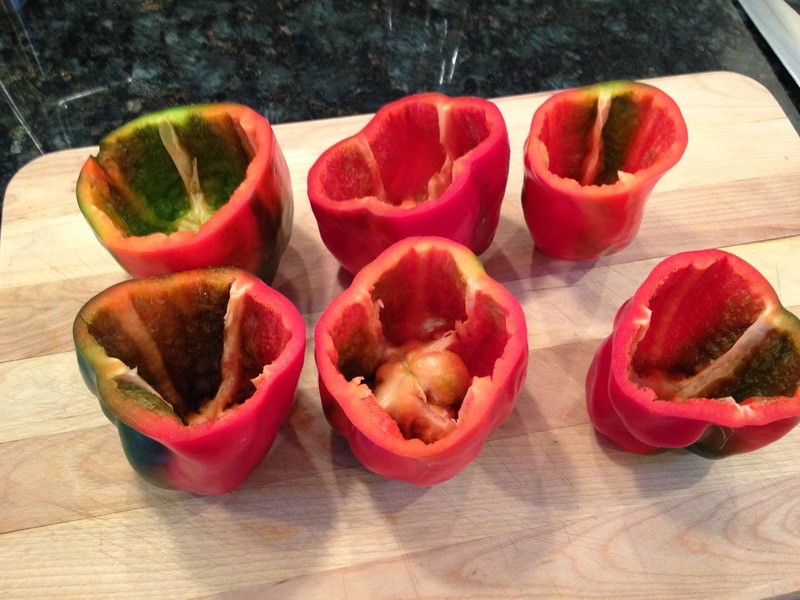 You may want to slightly trim the bottom of the peppers so that they stand up straight. 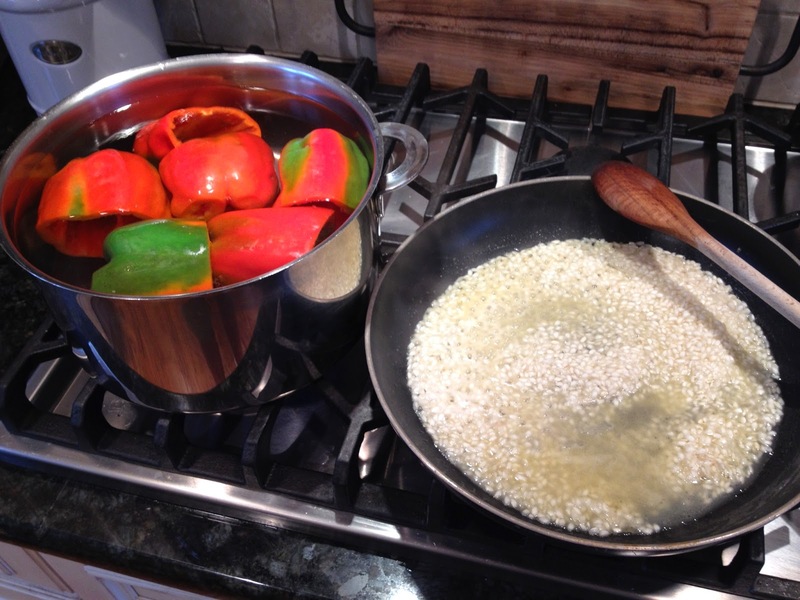 In boiling water, blanche the peppers for 3-4 minutes. No more – do not turn them to mush! Once the peppers are done, take them out with tongs and be careful to drain them of water. Set them aside to cool. Once the risotto is done, remove to a large mixing bowl. In the same pan, add a tablespoon of olive oil and saute the garlic and onions for a minute or two. Add the hot pepper, the Pine Nuts, and then the meat and cook through stirring regularly. Once the meat is cooked, remove the contents of the pan to the same mixing bowl holding the rice. Mix together well and test for seasoning. Add salt and pepper as needed. Using a teaspoon begin filling the peppers with the mixture. You can press the mixture gently down into the pepper a little, just be careful not to break the pepper. Fill them enough so that they are overflowing a little. The beauty part of this recipe is that although it takes some work up front, there is nothing tricky or technical here and once assembled, the dish is fully cooked and can sit at room temperature until you’re ready to eat. Pre-heat the oven to 350 degrees. Drizzle each pepper with a little olive oil and bake, uncovered for 20 minutes. At the 20 minute mark, open the oven and top each pepper with a bit of San Marzano Tomato Passata and a generous sprinkling of grated Parmigiano. Return pan to oven for 10 more minutes. These are delicious and sure to bring some memories flooding back. Easy variations would be to add sausage instead of pork. In Radda, I know they used ground Cinghiale. To put a Sicilian twist on this, add capers and/or golden raisins to your stuffing. I made a wild mushroom medley to serve on the side and this was a satisfying meal that paired well with both Chianti Classico and Dolcetto d’Alba.